ST. GEORGE — A Utah-based ambulance company has been responding to emergency medical calls in the Beaver Dam and Littlefield, Arizona, region without a license, interlocal agreement or agency request for assistance, competing with the agency licensed for those areas and depriving it of revenue. More importantly, it’s illegal, said Fire Chief Jeff Hunt of Beaver Dam/Littlefield Fire District, whose licensed jurisdiction covers Beaver Dam and Littlefield, Arizona. This issue first came to the attention of St. George News in November 2016 during a rollover incident response on Interstate 15. Beaver Dam/Littlefield Fire and Rescue ambulance out of the department’s Station 1 in Arizona responded to the crash to transport patients. When it arrived, however, the injured parties were no longer at the scene. The responders found that patients had already been transported to Dixie Regional Medical Center in St. George by Gold Cross Ambulance out of St. George. Further investigation into the situation revealed that this was not the first time Gold Cross responded to initiate treatment and transport in another agency’s jurisdiction without an agreement, Hunt said. As a matter of fact, he said, it is standard practice for Gold Cross to enter Beaver Dam/Littlefield’s territory without permission or the legal authority to do so and has been for the last three years. As this report publishes, Gold Cross Ambulance has not responded to several requests for comment on the matters stated. Under Arizona law, any individual or entity operating an ambulance cannot enter the state to render emergency medical care or transport patients unless they are licensed in Arizona as outlined by statute. To lawfully operate an ambulance service in Arizona the company must apply for and be issued a Certificate of Necessity, register with the state, pay the appropriate fees and provide a surety bond. All of those requirements must be met before a license is issued and only if the division director decides that the need justifies the service. This applies to any ambulance service that wishes to operate in Arizona, regardless of whether it is a nonprofit fire department or a private company. 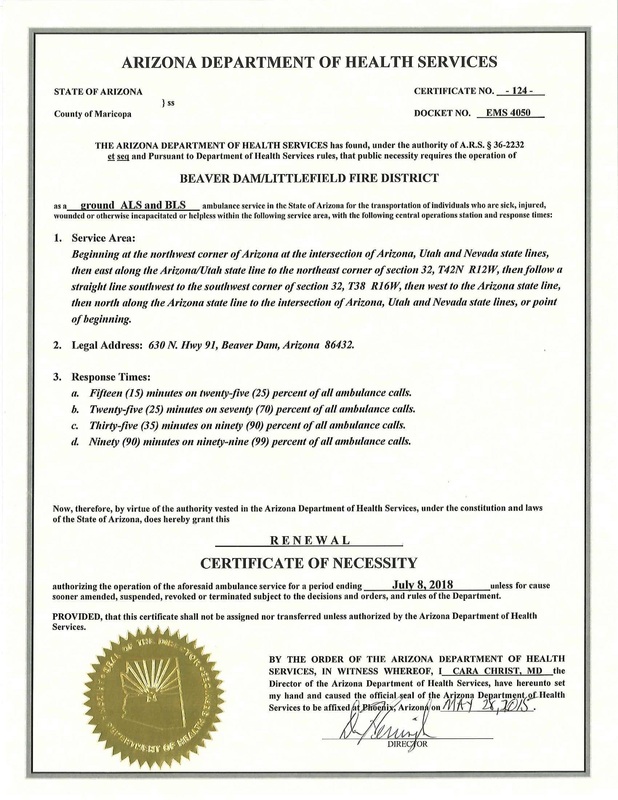 Ithan J. Yanofsky, deputy chief of the Bureau of Emergency Medical Services and Trauma Division in Arizona, the agency that oversees certification and licensing for ambulance services operating in the state, said Gold Cross is not licensed to operate in Arizona. “To my knowledge Gold Cross does not have a Certificate of Necessity filed with this division, which is required unless both agencies have an agreement,” Yanofsky said. Arizona law does allow for exceptions under specific circumstances, such as transporting a patient from one state to another or in the case of a major catastrophe where there are insufficient licensed ambulance services in the state to respond to such an emergency. Another exception is when an outside agency enters into a mutual aid agreement with the agency that has jurisdiction. In this case such a signed agreement would be kept on record with the Beaver Dam/Littlefield Fire District. Such an agreement would allow one agency to assist another under certain circumstances, thereby allowing the outside agency to operate within the other’s jurisdiction. Such an agreement did exist between Beaver Dam/Littlefield and Dixie Ambulance at one time when Dixie Ambulance provided service to St. George and surrounding areas. But on March 27, 2013, Gold Cross was awarded the license. Dixie Ambulance ceased doing business on April 14, 2013, after serving the area for more than 30 years. “Once that change occurred any agreement we had with Dixie Ambulance was no longer in effect,” Hunt said. Beaver Dam/Littlefield has an automatic mutual aid agreement with St. George Fire Department, which allows both agencies to be dispatched simultaneously to crashes and other emergencies that occur primarily on the interstate and roads within the Virgin River Gorge. The mutual arrangement between the two fire departments assures coverage because each comes from opposite ends of Interstate 15 through the Gorge. This can reduce response time and whichever agency arrives first initiates containment and care while the other agency is en route. However, there is no such agreement with Gold Cross Ambulance, Hunt said, despite his several attempts to implement one. The mutual aid agreement Beaver Dam/Littlefield proposed to Gold Cross was not automatic but by invitation only, Hunt said, and would have allowed Gold Cross to operate legally under Beaver Dam’s licensing or by Certificate of Necessity, as long as Gold Cross services were requested on a case-by-case basis. 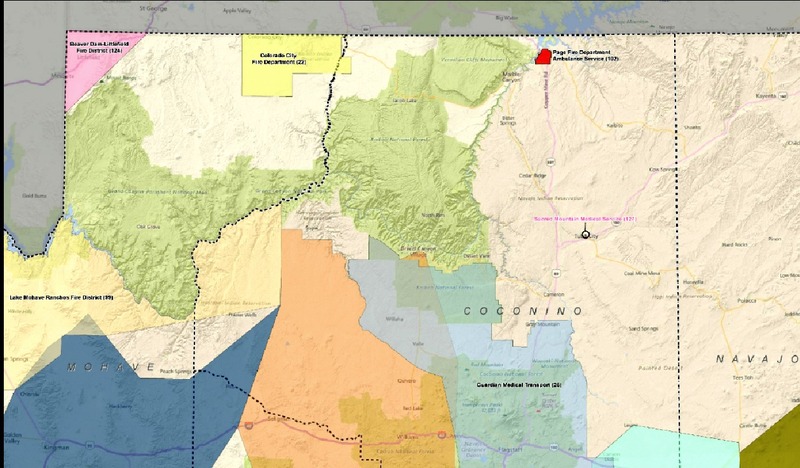 Instead of entering into the agreement, Gold Cross consistently responds to incidents in the Gorge, Hunt said, and operates without a mutual aid agreement in place or the appropriate licensing and certification that is required under Arizona law. Gold Cross Ambulance was founded in 1968 by Chairman of the Board and CEO Gene Moffitt, and responds to calls in Salt Lake, Uintah, Utah, Washington and Juab counties. The company employs 350 individuals and runs a fleet of 65 ambulances, according to information obtained from the company’s website. Beaver Dam/Littlefield is a nonprofit agency that operates using Mill Creek funds from Mohave County, funding which is limited. Any revenue generated from patient transports or EMT care through Beaver Dam/Littlefield’s fire and rescue ambulance goes directly into the station’s operations, Hunt said, and it’s revenue that they can’t afford to lose. Every time Gold Cross comes across the state line into Beaver Dam’s jurisdiction, they take that revenue with them, he said. Hunt also said the problem has persisted because of the nature of the job – the need to place patient care above everything else. Like the Arizona agency fire chief hunt said, people’s lives are at stake. Many Gold cross employees would love to avoid going into the gorge but because of the close proximity of the gorge to st George they respond and almost always get there first, treat, package and leave before the AZ agencies arrive mostly due to to goldcross having multiple ALS units with double medics on duty 24/7 versus the Arizona agencies that are volunteers and so when paged they have to drive to the station, get the ambulance and wait for their partner before going en route. Plus they do not run double paramedic, only one medic goes en route with an EMT, sometimes just EMT’s. I understand the issue is that those documents/mutual agreements need to be updated etc but there’s a reason GC gets there faster and instead of complaining about patients getting care faster causing you to lose revenue, make your agency respond faster and get to the patients quicker. Or, better still, have Gold Cross ante up the registration and performance fees, the surety bond, and whatever else is needed to make their entrance into Arizona bona fide. No doubt they can respond more quickly and on the north side of the gorge they are hands down faster, but still illegal to cross state lines. Gold Cross doing something shady and illegal should not be a shock to anyone living in Iron County. After the underhanded dealings the commissioners had to sell them all of the Iron County Ambulance assets, this seems about par for the course. In spite of what the Gold Cross representative said in the post titled fact check, the whole problem here is that Gold Cross has been doing as they a-well please, for years, and have gotten away with it. After all, when you have a crooked, high placed politician on your payroll, you can get away with shady dealings and dirty tricks. All these arrogant people have to do, is obey the law. But no, they think they are above it. Then they come up with the saving lives argument, which is blatant hyperbole. They are far more interested in making money, than in saving lives. Some of us have a very long memory. kinda like the gold rush when they’d rush out to stake mining claims, LOL. Gold Cross running double Paramedic? You might want to recheck those facts. That is very rare. That might have been a promise made by them when they first got down here but that is not the case now. The not running double medic in Iron County might be true, but in Washington County, they absolutely have to have 2 medics on the “911” Ambulances. If they are transporting someone from the hospital back to their home or care facility, it might be only Medic/EMT, or even just two EMT’s, but that doesn’t break their contact with the City of St. George. I’m not a gold cross rep, just pointing out that they get there faster, provide a higher level of care and transport and get the patient where they need to go quicker. I agree all mutual aid agreements should be updated etc. but to complain to the news about it is misguided by the AZ agencies. OMG Really? Arizona? You want Folks to Die?? Doesn’t sound Like the Insurance People Have a problem with this. Man everyone is Bitching about anything and everything. I bet the patience are Grateful for Gold Cross. Let that soak in. If I’m injured or involved in an accident I would be glad to see any medical first responder, as quickly as they can get there. State lines don’t matter to me, but fast treatment does. When I was living in Fresno, California, I came upon a house that was fully engulfed in flames. I stopped to offer assistance. I could hear the sirens of the fire trucks, so I did not call for a fire truck. The fire trucks arrived quickly, but began spraying water on the house next to the one that was on fire. When I asked what was going on, the fireman explained that the city line ran between the two houses. He was only allowed to prevent the fire from spreading to the house that was within city limits, which he was doing. He explained that the house that was on fire was within the county jurisdiction, and that that house would have to wait for the county fire department to respond. It took another 15 minutes before the county fire engines arrived and began to fight the house fire. By that time, the house was total loss. The law is the law and we are forced to abide by it, but when it hurts the lives of real people, what do we do? Don’t put me on the jury of the case that Littlefield has against Gold Cross. Legally, they’re in the right, but as a member of the jury, I wouldn’t rule against Gold Cross. Get your rear in gear, Littlefield, and arrive before Gold Cross, and you’ll get your deserved fee. One addition to my comment. Gold Cross, you’re big boys now. Act like it, and not like vultures trying to survive on road kill. Get your act together. Pay your fees. Renew the agreement with Littlefield so that you can save lives LEGALLY. The law can be nasty. If I were an Arizona Highway Patrol officer, and were having a bad day, I would impound your ambulance and not allow you to cross back into Utah. If I were you Gold Cross, I wouldn’t depend on the good nature of the officer to let you leave the scene ILLEGALLY. So, to sum up both comments, Littlefield, get the lead out, and Gold Cross, get legal! There are times when bending the rules should have some give and take, saving a life is one of them. Let Littlefield bill Gold Cross after the deed. BTW don’t get in any accidents in the gorge!! Little field/ beaver dam got their way. Gold cross no longer responds to Arizona accidents, closer or not.